The wonderful little town of Sainte-Suzanne was brought to our attention over a year ago by some French guests who came across it whilst staying at our bed & breakfast – we were ashamed to confess that we had never heard of it, despite the fact it is only about 50km from us in the Mayenne (adjoining department in the Pays de la Loire). It has taken us another year to actually visit it, which we did in mid-October – and now we wish we had done so earlier. 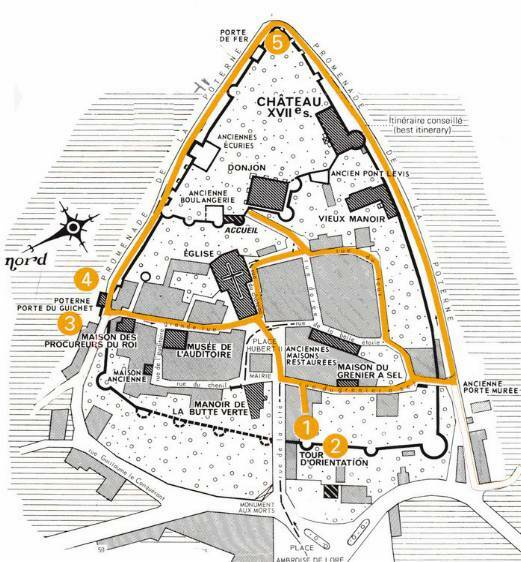 This fortified “cité médiévale” in the region known as “les Coëvrons” really is deserving of that old cliché “hidden treasure”. Sainte Suzanne is wonderfully picturesque without being twee, well cared for, characterful and perched atop a rocky promontory dominating the valley of the river Erve, 250 feet below. It is not difficult to see why this spot was chosen to build a major fortress, as its position gives it both natural defences and wide views over the surrounding countryside. Accordingly, the town of Sainte Suzanne has a rich military history. 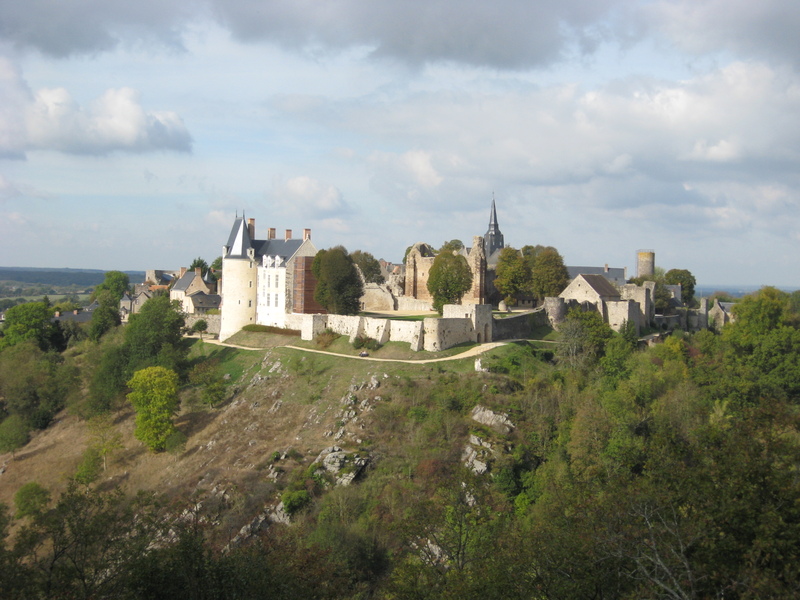 The castle keep (donjon) was built in the 11th century and Sainte Suzanne boasts it was the only town that successfully resisted an attack by William the Conqueror, who laid siege to it from 1083 to 1087. During the prolonged siege, William built a huge military camp on the outskirts of the town, possibly taking advantage of an earlier Gallo-Roman earthworks; a reconstruction is on view in the town museum and the amazingly well-preserved remains can be seen at the site known as Camp de Beugy, 800m north of the town on the road to Assé-le-Bérenger. It is also known as the “Camp des Anglais” – King William and his army were regarded by this time as English, not Norman. 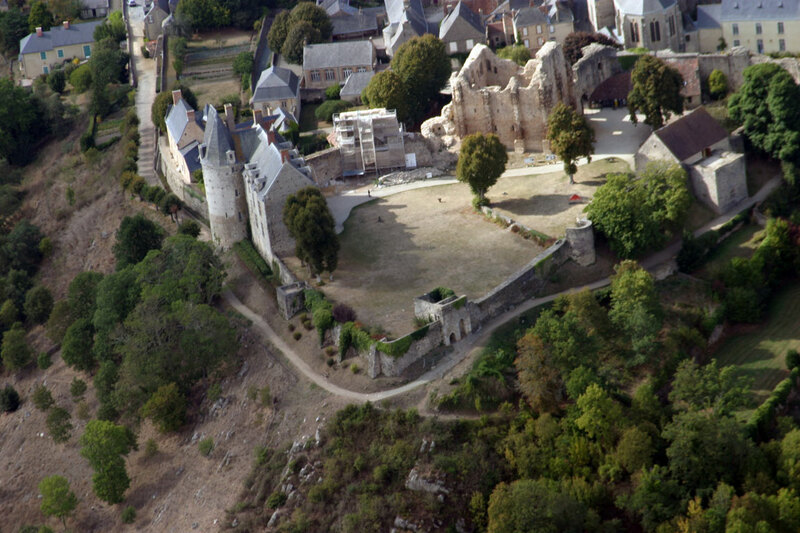 The town of Sainte-Suzanne remained impervious to attackers for another three centuries, until during the 100 Years War the castle fell into English hands for 14 years before being re-taken by the French Lord of Bueil. From the 17th century onwards the town’s prosperity grew and in the eighteenth century it became an administrative centre for the region. The city underwent another economic surge thanks to numerous paper, flour, wool and tanning mills powered by the river Erve and by the mid-19th century it had over 1 800 inhabitants; it returned to a primarily agricultural economy in the 20th century. An audio-guide of Sainte Suzanne can be hired from the museum inside the château – the cost is a very reasonable 2€ per headset. There are signposted walks and cycle routes to explore the valleys round about the town. The walk up to the Tertre Ganne takes you to a superb vantage point on the hill opposite the town, and a great place for a picnic. 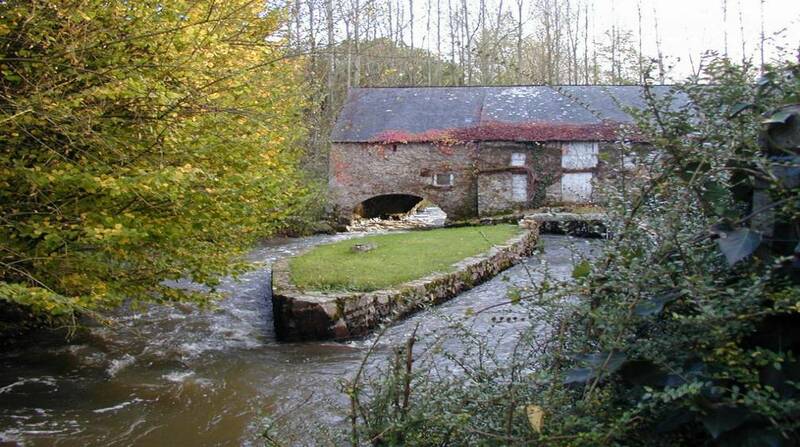 There are also guided walks, including one that sounds interesting – it explores the various watermills along the Erve. Starts at the museum in the town at 2.45pm each Sunday from March to November. We took a walk along part of the river unguided. The “Camp des Anglais” is is 1 km away on the road to Assé le Béranger and is the site where William the Conqueror constructed a fortress during the siege of Sainte-Suzanne. 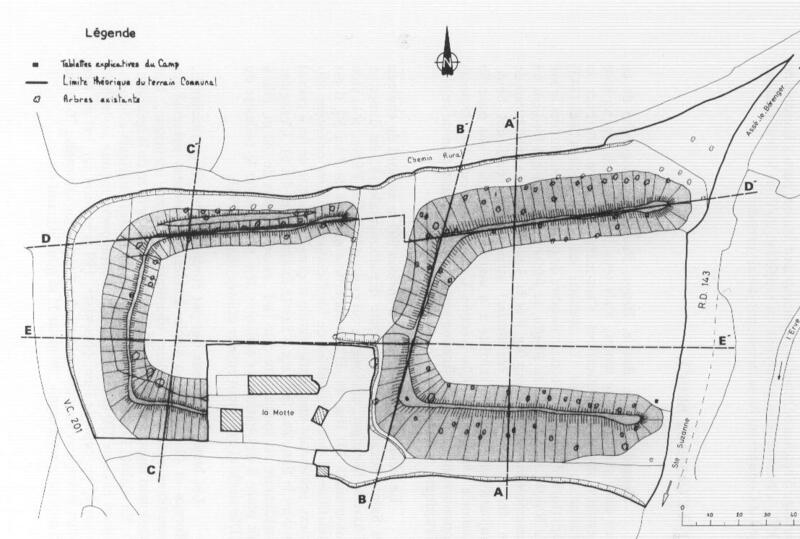 Also marked as “Camp de Beugy”, the earthworks and defensive ditches are well preserved, and you can explore them on foot. 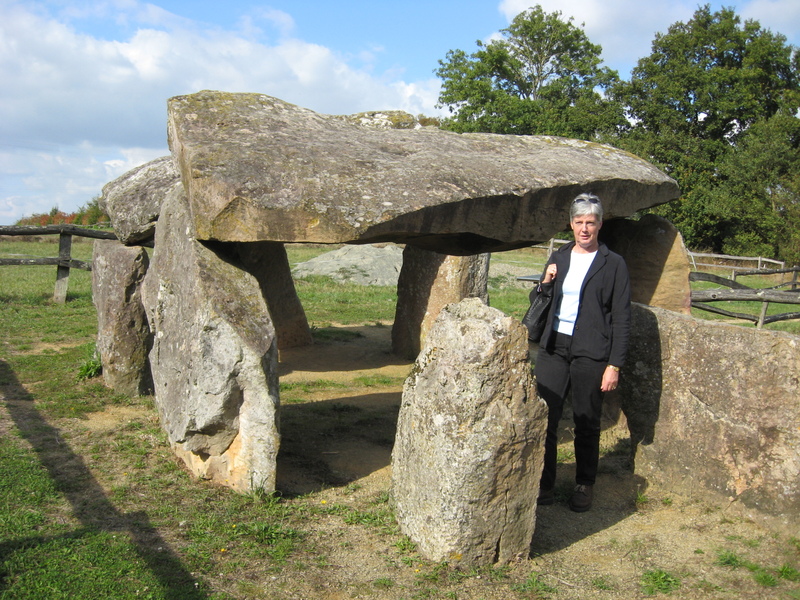 The “Dolmen des Erves” is 3 km away on the same road to Assé le Béranger. This is the earliest proof of people living in this region and dates to 4500 BC. 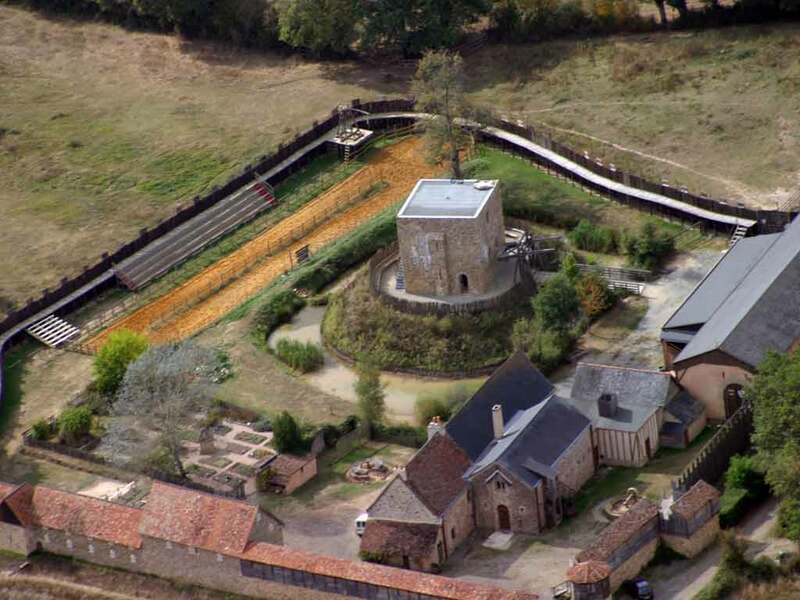 “La Ferte-Clairbois” near Sainte-Suzanne is a reconstruction of a wooden medieval fort with towers, keep, drawbridge, and so on; Sundays from Easter to October it stages a storming of the “castle”, jousting and sword fighting. A “medieval banquet” can be taken by reservation in a nearby auberge (ask at the Tourist Office in Sainte Suzanne). Sainte-Suzanne is 55km (c. 50 minutes) away from our B&B on the Normandy-Pays de Loire border, driving via Sillé-le-Guillaume. why is it called Sainte-Suzanne? Who was she? Sainte Suzanne lived in Palestine during the reign of Emperor Maximian in the 4th century. After being baptised, she decided to become a monk but this wasn’t possible for a woman. So she donned men’s clothes and lived as a monk for twenty years in the monastery – a sort of 4th century, Christian, Yendl – until one day she was accused of having abused a girl from the neighbourhood. Threatened with excommunication by the bishop, she revealed her true identity and was ordained a deaconess. She was arrested by the authorities and summoned to deny her faith in Jesus Christ but she refused and was martyred by burning at the stake. My family and I visited St Suzanne two years ago whilst staying near Laval. We just stumbled across it and spent the next few hours wandering through the narrow streets, looking in the various fascinating little shops, exploring the museum – which our sons thought completely amazing. We bought some food and had an impromptu picnic on top of the hill, at the top of the town, and didn’t leave until after dark – we discovered a music festival was going to take place that evening, so we decided to have our dinner at a restaurant in the square. It was really amazing – the best days are always unplanned!! At the commencement of the siege in 1083, Count Alan Rufus was commander of Willilam’s forces at Camp de Beugy. It may have been his fame that drew knights from across Europe to defend the castle, as perhaps they were hoping to be the first to best him in battle. Many of WIlliam’s best knights were slain there over the next four years, but not Alan. Sainte Suzanne had 300 defenders inside, plus all the bold French knights who came to their rescue. The besiegers were William’s bodyguard: 200 men in total: so they were outnumbered. He’d taken the rest of his army back to England to face down his half-brother Odo, Bishop of Bayeux and Earl of Kent, who was preparing to take much of England’s garrisons to Rome in pursuit of his own ambitions. William neglected to bring the army back (as the article notes, for 3 or 4 years! ), so the siege dragged on at great cost to the diminishingly few loyal besiegers. Viscount Hubert de Beaumont-au-Maine, Lord of Sainte Suzanne, eventually agreed to submit to William, in return for lands in England. I visited Ste Suzanne in 1992 with my sister, brother in law and one of their friends. It truly is a hidden treasure! It’s a truly wonderful and marvellous place, and now has got a small charming restaurant on the main square serving delicious regional treats and great wines in a cosy, very frenchy atmosphere – at great prices! Hi Phil and Jude. Your slide show brought back memories of Ste Suzanne, some of which I’d like to forget. I found the walls at the top of the tower a little too low for comfort! Yes, we also wondered how this special place could be so little known. When we saw Ste Suzanne in 2008, there was an exhibit of drawings by Francis Dermaut for a bande dessine series, Routes (chemins?) de Malfosse. Not sure what his connection with the town is, but it was a very interesting exhibit. Previous Normandy – Mont St Michel and D-Day Beaches, is that it?